Ithaca College president James J. Whalen was presented the Henry S. Paley Memorial Award during the National Association of Independent Colleges and Universities’ annual meeting February 6 in Washington, D.C. Also honored was U.S. secretary of education Richard Riley, who received the NAICU Award for Advocacy. 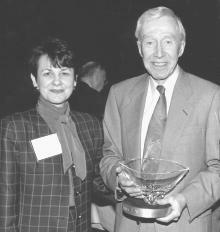 The Paley award is named for Henry Paley, the president of the Commission on Independent Colleges and Universities of New York from 1975 until his death in 1984. "This year’s award couldn’t go to a more deserving, more able, more effective leader than Jim Whalen," said NAICU president David Warren. Whalen said he was honored by the recognition. "If there were a single message that I believe Henry Paley would wish to instill in all of us, it would be that each of us actively participate in the broader agendas affecting higher education," Whalen said. "We must all find the time and energy to devote to the ‘big picture,’ not because it looks good on our résumés but because that is how we can best serve our students and society. That is what I believe the Paley award is all about and I accept it with all humility." Ann H. Die, chair of the NAICU Board of Directors, said Whalen "has set an example for all of us who seek to advance educational opportunities in the United States."